This protocol template was contributed by L. Collado-Torres. This protocol is about creating repositories under the leekgroup organization account that Jeff setup. This summer there are a few interns at leekgroup and they motivated me to write this protocol. Recently Jeff created a GitHub organization account called leekgroup. The goal is to have all the code that is created at the Leek Group saved there. It is a great way to organize all our code and make it easy for us and others to find what everyone at Leek Group is doing. I believe that another strong reason is that having our code in an organization account means that Jeff ultimately retains some control over the repositories. Previously, with our code hosted in our accounts, accidents could happen where someone deletes a repository with code Jeff would like preserved, among other bad scenarios. There is a disadvantage to leekgroup, which I believe is minor. At leekgroup there are no private repositories. This means that all your code is public. With personal accounts, if you have an email account from an educational institution, you can apply for the student developer pack which gives you 5 free private repositories, which would otherwise be $7 a month at the time of writing this procotol. In the past, I have used private repositories for version controlling code from projects that are in development. Arguments against this position are (1) that you should write your commit history assuming others will read it, and (2) that you should fear people not paying attention to your work instead of the opposite (I'm paraphrasing Matthew Stephens in the second argument). Nowadays I'm in favor of having all code public and I think that potential employers in both industry and academia will love to see your code history. leekgroup could have private repositories, but Jeff would have to pay a monthly fee which seems unnecessary. Note that if you really want lots of private repositories, Bitbucket gives free unlimited private repositories if you use an academic email and your academic institution is in their list (otherwise apply to get it added). If you do use private repositories, I recommend making the repository public once your project is published. If you plan on doing so, make sure your commit history is written in a way that you wouldn't mind sharing it with others. If you are concerned about having your code public, talk about it with Jeff. Just remember that there are many advantages to having your code public and keeping everything organized. First, Jeff has to add you to leekgroup. If he hasn't yet, email him your GitHub account username. Lets say that you already have a repository at GitHub called my_repo. If you have it at Bitbucket, then check adding a remote. What you basically need to do is transfer ownership of your repository to the leekgroup account. The website transferring a repository describes this process in detail. That you should update the URL for the origin remote (described at the end of the previous link). If you are starting a project from scratch, you simply have to open github.com/leekgroup, log into your account, and click on "new repository". Then follow the instructions from create a repo. Once it's created, you can clone it to your computer to have a local version where you can work on it. Most of the repositories at leekgroup either have code that allow you to reproduce a specific analysis or host the code for a software tool such as an R package. I'll cover some basics of a repository that has analysis code written in R.
You can obviously organize your analysis code however you want. But given that you are hosting your code in GitHub, you might as well take advantage of GitHub Pages. Basically, HTML content from your gh-pages branch at my_repo will be publicly viewable at http://leekgroup.github.io/my_repo/. For example, the code from the project derSoftware is available here. The derSoftware repository has the supplementary material for the derfinder paper (Collado-Torres, Frazee, Love, Irizarry, et al., 2015). Note how the only branch is gh-pages. When you create a repository at GitHub, the default branch is called master. If you only want a gh-pages branch, you first have to create it. You can create it locally with the code shown below or at Github following creating and deleting branches within your repository. Next, I recommend deleting the master branch to minimize confusion unless you are proficient with handling multiple branches. Follow the instruction from the previous link. If you want to have multiple branches, you can set gh-pages to be the default one by following the instructions here. For more info, check the basics about git branching and merging. I like the feature in Slack that allows you to get notifications from changes in your GitHub repository at a specific channel. For that to work, you need to set up the GitHub integration. Then, you'll see a message in Slack whenever someone makes a commit, submits a pull request, writes a comment, etc. It's a great feature and an easy way to keep everyone in your Slack channel updated about your progress. 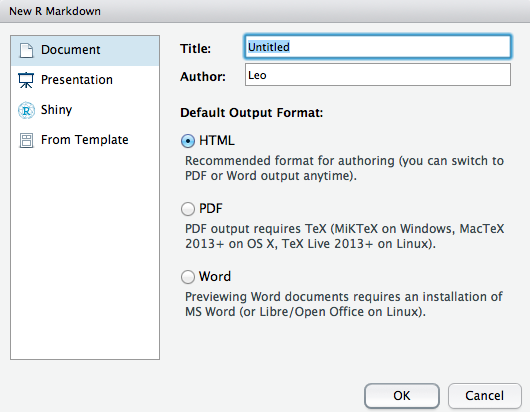 Then choose HTML document as the output as shown below. Then simply modify the content, save the file as index.Rmd, and render the HTML document index.html. Add both of them to the git repository as well as the empty .nojekyll file ("git add") and push them to GitHub. Your project index should be live soon. Keep updating it so members of leekgroup know where to find the latest results you've created. Alternatively, your index could simply refer viewers to the README.md file of your repository. Instead of having a huge document that runs all the steps of your analysis, I recommend breaking it up into small parts. I save each step in its own directory as you can see in the derSoftware repository. I then add a link to each of the steps in my index file. 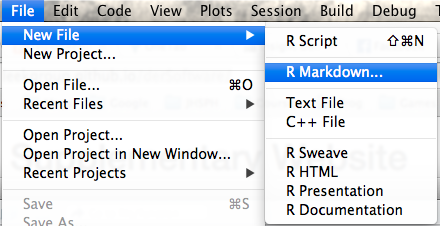 Inside each analysis step, you could save the script as index.Rmd, but I prefer to name them after the actual step I'm performing. Just remember that you have to include the file name in your links if you do so. See for example lcolladotor.github.io/derSoftware/timing/timing.html where I called both the analysis step directory timing and the script timing.Rmd which generated timing.html. As general practice, it's best if you include comments about what you are observing in the plots / tables you create. This might mean that you'll have to run the analysis twice. Once to create the results, and another one to include your interpretations. However, if the analysis step takes too long, consider writing it as a simple R script, and then using R Markdown for loading the results and making the plots. If you are saving your progress in HTML files, then take a peak at some features that could make your reports interactive, such as interactive tables. Enjoy! Date this protocol was last modified: 2015-06-22 18:23:12.